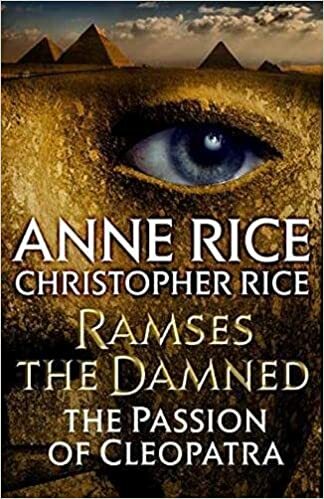 I haven’t read the original Ramses the Damned novel since I was bar mitzvah age, but I remembered enough of the details (and remembered more during the reading of the book) to be very excited upon learning earlier this year that Anne Rice had written a sequel twenty-eight years after the original with her son, author Christopher Rice (whose books I need to put on my reading list one of these days). And now that I’ve read the Rices’ first collaboration, what do I think? Well, you know how George Miller revisited the Mad Max franchise with Fury Road several years after the last entry, with a new cast and crew to help shape his vision, and the results were pretty awesome? It’s kind of like that. Ramses the Damned: The Passion of Cleopatra revisit Ramses and Julie Stratford shortly after the events of the last novel, preparing for their engagement party and their lives as globe-trotting immortals. However, news that Cleopatra is still alive reaches their ears, and there’s a chance she still holds a grudge against them. And as if that weren’t enough, new forces threaten the immortal couple, including an ancient queen whose very existence will turn the immortals’ world upside down. Honestly, I could not tell this was a collaborative work. This may be because I’m unfamiliar with Christopher Rice’s work, but it’s more than likely he’s very good at imitating his mother’s style. Whatever the reason, the novel has a great story and moves along at a nice pace. The expansion of this fictional world to include new elements and characters didn’t feel forced or weird, and the twists and dramatic moments really allowed you to feel the surprise and attention when they occurred. You can’t complain about that. And let’s talk about the new characters, because they were great! Bektaten’s addition to the cast was a real shake up, as was her companions Enamon and Aktamu (I hope I didn’t butcher those names trying to spell them). There’s a gravitas to them that leaps off the page and commands respect not just from characters, but from readers. It’s as if their many centuries have allowed them to transcend many human flaws and become something more. Imagine what they could be like in our modern world! It’d be truly something to see. But of course my favorite new character (and possibly my new favorite character) is the aptly named Sybil Parker, an American author whose dreams cause her to be roped into this strange and magical world. * From the moment she appears on the page, she is just so interesting to follow, as her part in the story is so full of mystery and a bit of intrigue. And her arc, going from this timid homebody to this brave young woman who doesn’t bat an eye at immortals, was masterfully written. I don’t have any real problems to point out with this story. Possibly a bit more of Elliot Savarell would have been nice, but that is probably nitpicking on my part. All in all, Ramses the Damned: The Passion of Cleopatra is a great return for a story we had thought finished long ago. On a scale of 1 to 5, I give the novel a 4.8. Pick it up, and get wrapped up in the story (been waiting a week to make that pun, and it was worth it). But tell me, what did you think of this novel? What immortal creatures will we get from Anne (and possibly Christopher) Rice next year (I’m hoping angels)? And which Christopher Rice novel should I put on my reading list? Let’s discuss. *Sounds like my dream life right there. Well, hopefully the former will be achieved someday soon.